CD review: "Mi Vida Loca"
This review first appeared in the August 7, 1992 issue of the North County Blade-Citizen (now North County Times). Chris Gaffney hails from Southern California, but his sound is straight from Texarkana. His funky, danceable Tex-Mex country is anchored by his accordion, and his backing band, The Cold Hard Facts, is as tight a combo as any. What makes Gaffney's music work so well is his songwriting skills. From the off-beat humor of "Get Off My Back Lucy" and "Psychotic Girlfriend" through the traditional country complaining of "Six Nights A Week" and "They Made A Mistake," Gaffney's tunes are as melodic as anything on the radio. As a vocalist, Gaffney is nearly as good as he is a songwriter. His rich, deep voice shows flexibility, handling the slow "Waltz for Minnie" as well as the uptempo "Silent Partner." 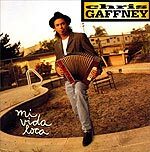 While there aren't too many accordion players coming out of SoCal, Gaffney is the goods and worth checking out.